Create a masterpiece with historical significance! 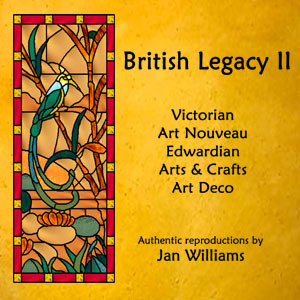 British Legacy II is an expansion of the popular British Legacy vintage stained glass pattern collection. On this new CD, you will find 78 authentic and extremely rare full-color designs from historic European windows developed with the same painstaking care and attention to detail as its predecessor. With British Legacy patterns, our modern day homes can reflect the same elegance and glamour that the Victorian aristocrats once enjoyed. Designs in this collection contain extraordinary examples of the finest and most sought after stained glass designs from 19th and 20th century Europe. Included are a variety of sailing vessels, landscapes, birds and windmills accompanied by heraldic shields and elegant traditional Victorian, Edwardian, Art Nouveau, Art Deco and British Arts and Crafts motifs. In an effort to keep the legacy alive, all available data pertaining to the original windows such as period style, original dimensions, date and origin is included for each pattern design. Windows made from these authentic historical stained glass patterns will one day themselves become valued heirlooms.